The Isle of Wight is separated from the English south coast by a channel of water called the Solent. The island itself is a thing of beauty, a place where time has stood still and people have time for each other. There are plenty of dog friendly places and acres of rolling countryside fringed with beaches and cliff top walks. Every other village has a friendly pub and something to admire. 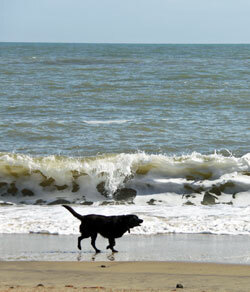 The dog on the beach in the photograph is on the main beach at Ventnor in April when dogs are allowed. This is a lovely stretch of sandy beach with a little shingle. Colourful beach huts line the back of the beach. Find out more about Ventnor on this wonderful holiday island and give yourself a self-catering holiday to look forward to. Both people and dogs like to walk on beaches. It is nice to go for a paddle, to be able to throw a stick for your dog to fetch. It's the freedom of it all that appeals. The larger beaches at seaside resorts tend to be out of bounds to dogs between the 1st of May and 30th of September. Sometimes the weather can be quite lovely in April (for Easter) and October so that it is possible to enjoy yourself with your dog on all the beaches the island has to offer. A rented holiday cottages is one of the best forms of holiday accommodation for dog owners because there is plenty of room and often a small garden where your dog can go out. Read about self-catering cottage breaks in autumn and spring self-catering holidays on the Isle of Wight. There are numerous beaches without any restrictions all year round. These tend to be the less popular beaches with few amenities and that does not matter - your dog doesn't need deck chairs or ice creams. The colour streaked cliffs of Alum Bay, near the Needles chalk stacks, are shown in the photograph. The beach in the bay is dog friendly. Other pet-friendly beaches on the Isle if Wight include some in the towns of : Bembridge, Bonchurch, Brook, Compton Bay, Reeth Bay (near Niton and Ventnor on the south coast), certain beaches in the large seaside resort of Ryde, St. Helen's (near Bembridge Harbour), Steephill Cove and Yaverland. Apart from the beaches, there are lots of cliff walks for fresh air and good views. Much of the countryside on the Isle of Wight is described as an Area of Outstanding Natural Beauty. There are rural scenes that stop you in your tracks and places where you would like to sit and take in the beauty around you. There are also lots of pleasant woodlands, farm tracks and trails where you can walk and enjoy the countryside. Even if you stay in the heart of the island near Godshill or near the main town of Newport, the coast is never more than half an hour's drive away so that you can still have a few days on the beach if you want a joint country and beach holiday. Stay in a rural cottage on the Isle of Wight for peaceful nights of good sleep so that you feel relaxed and rejuvenated by your holiday. Do take a look at some of the different types of pet-friendly cottages on the Isle of Wight. 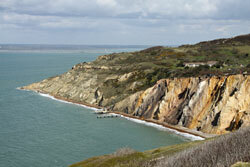 Alum Bay is a scenic place, do let us know what you liked. We like Alum bay, what do you like about it?